Goodreads says, "A shocking discovery on a honeymoon in paradise changes the lives of a picture-perfect couple in this taut psychological thriller debut--for readers of Ruth Ware, Paula Hawkins, and Shari Lapena. f you could make one simple choice that would change your life forever, would you? Erin is a documentary filmmaker on the brink of a professional breakthrough, Mark a handsome investment banker with big plans. Passionately in love, they embark on a dream honeymoon to the tropical island of Bora Bora, where they enjoy the sun, the sand, and each other. Then, while scuba diving in the crystal blue sea, they find something in the water. . . . Could the life of your dreams be the stuff of nightmares? Suddenly the newlyweds must make a dangerous choice: to speak out or to protect their secret. After all, if no one else knows, who would be hurt? Their decision will trigger a devastating chain of events. . . . Have you ever wondered how long it takes to dig a grave? Wonder no longer. Catherine Steadman's enthralling voice shines throughout this spellbinding debut novel. With piercing insight and fascinating twists, Something in the Water challenges the reader to confront the hopes we desperately cling to, the ideals we're tempted to abandon, and the perfect lies we tell ourselves." Mark and Erin are planning to get married and go on a luxurious honeymoon. Despite Mark's financial woes, they are taking a trip of a lifetime to Bora Bora. It's a magical vacation (even when there's heavy rain!) that is until Mark convinces Erin to go scuba diving. While scuba diving in an area off the beaten path, they find something in the water that changes both of their lives irrevocably. They seem like a normal couple, but after their honeymoon, things are never the same. Catherine Steadman's Something in the Water is the perfect thriller for a day at the beach or a rainy Saturday afternoon. The book had me guessing until the end and it made me think about what I would do in the same tempting situation. Erin and Mark seemed like your average couple and very much in love in Something in the Water. Erin is an interesting character that is working on a documentary about people in prison. We learn about it and it doesn't seem important at first, but it is. Then there's Mark. I did feel badly for Mark when he lost his job as an investment banker and then consequently their plans change for the upcoming marriage due to the decreased cash flow. The one area they didn't want to cut back on was the honeymoon in Bora Bora. So, despite the current state of their finances, they head off for a gorgeous and romantic vacation. As I mentioned, things take a turn for the worse when they go scuba diving though and find something. I don't want to go into the details too much, but whoa. It really made me think about what I would do in the same situation. The opening of Something in the Water made me do a completely 360. The story opens with Erin digging a grave. I won't say whose grave or why or even when, but that really sucked me in. Then the story flashes back to previous events, but in the back of the my' mind I kept wondering how something could go so spectacularly wrong? 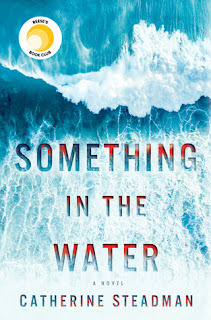 Something in the Water felt like a James Bond novel that was light enough for vacation, but thrilling enough to keep me on the edge of my seat. I definitely have my eye on Downton Abbey actress, Catherine Steadman, as she is a debut author, and I look forward to reading more of her work in the future. I really enjoyed this one! I actually thought it was pretty plausible for a thriller and although I kind of started to suspect something as the book went on, I was still surprised. I know, right? I had the same thoughts! I'm glad you enjoyed it as well. I think it would translate to the big screen well. I'd definitely like to see it as a movie. Thanks for visiting, Angela! I thought this book was bananas! But I still really enjoyed it. The decision making by the leads just kept getting weirder and wackier - I could not put it down! I know, right? I felt the same way. Very entertaining! Thanks for visiting, Michele!